The Tiangong-1 Chinese space station has been widely covered over the past few months, but it’s not the type of coverage astronomers want when discussing a space station. Back in October, China admitted that it had completely lost control of the Tiangong-1 space station. Having no way to steer the spacecraft’s path in orbit around our planet is obviously a bad thing, and officials from China’s space program said that the space station would eventually come crashing back down to Earth. Some rough estimates were given at the time, but further analysis by the European Space Agency (ESA) determined that the Tiangong-1 space station would likely smash back down into Earth sometime between March 24th and April 19th. It’s now mid-March, which means we’re now perilously close to seeing the station’s inevitable demise. In fact, the most recent estimates suggest that the impact is most likely to occur in late March, as opposed to early April. 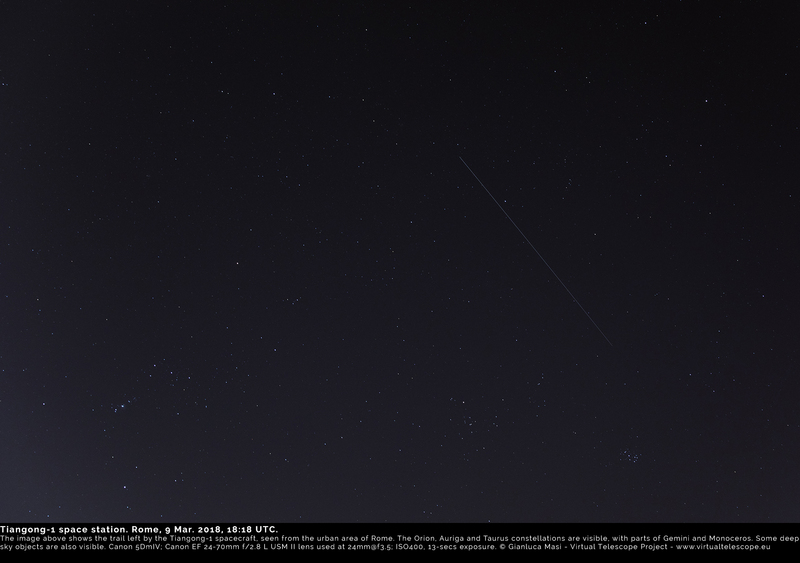 Now, Tiangong-1 has been photographed as it makes its way through space and back down toward Earth. First, the good news. It is believed that the Tiangong-1 space station — whose name ironically translates to “Heavenly Palace” — will be burnt up almost entirely by the Earth’s atmosphere as it barrels back down toward the planet’s surface. This is especially good news because of all the toxic chemicals and rocket fuel aboard the space station. The bad news, however, is that whatever pieces of Tiangong-1 do make it through our atmosphere will come crashing down somewhere in the northern hemisphere. It’s still unclear exactly where the space station will crash, but estimates include the northern United States, parts of Spain, Portugal, Greece, China, the Middle East, and some other countries. The ESA and other space agencies have warned that people in the area where Tiangong-1 makes impact should avoid any wreckage, just in case any toxic materials survive the fall. As agencies continue to monitor the out-of-control space station’s path, astronomer Gianluca Masi has managed to photograph the Tiangong-1 as it tumbles toward Earth. Masi, who is with The Virtual Telescope Project, managed to capture the craft as it passed between Earth and some well-known constellations, and the resulting image was posted on The Virtual Telescope Project’s blog over the weekend. The image above, which you can click to enlarge, shows a small streak in the skies above Rome, Italy. Masi explained exactly how he captured the photo in his post on the organization’s blog, and we definitely suggest giving it a quick read.